Be more than simply a Lord; become the most powerful Ally to the King. 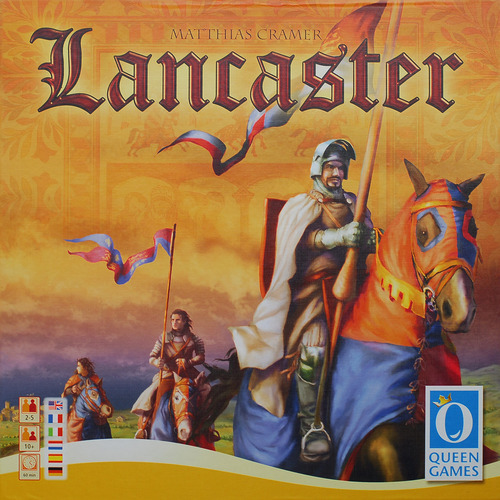 Lancaster is a worker placement game that takes place during the time of Henry V of Lancaster, King of England. During the course of the game, players will deploy their knights to counties within England, to their castles, or to conflicts with France. Each location type brings its own reward. A player's knight can be forced out of a county location by an opponent's stronger knight. Conflicts can be won through cooperation among players, with the rewards being split based on the strength of the knights committed to the conflict. Additionally, players will vote on laws coming out of Parliament. These laws affect the abilities that players have on their turn. The game lasts five rounds with players earning points by gathering up noblemen from the counties, by being victorious in conflicts with France, by adding the most strength to their knights, and by building the most extension onto their castles. The player with the most points after 5 rounds will be the winner. We have an open copy of Lancaster available in our Store Demo Games Library for you come in and try.